Animals use different modes of thermoregulation processes to maintain homeostatic internal body temperatures. Outline the various types of processes utilized by animals to ensure thermoregulation. In response to varying body temperatures, processes such as enzyme production can be modified to acclimate to changes in the temperature. Endotherms regulate their own internal body temperature, regardless of fluctuating external temperatures, while ectotherms rely on the external environment to regulate their internal body temperature. Homeotherms maintain their body temperature within a narrow range, while poikilotherms can tolerate a wide variation in internal body temperature, usually because of environmental variation. 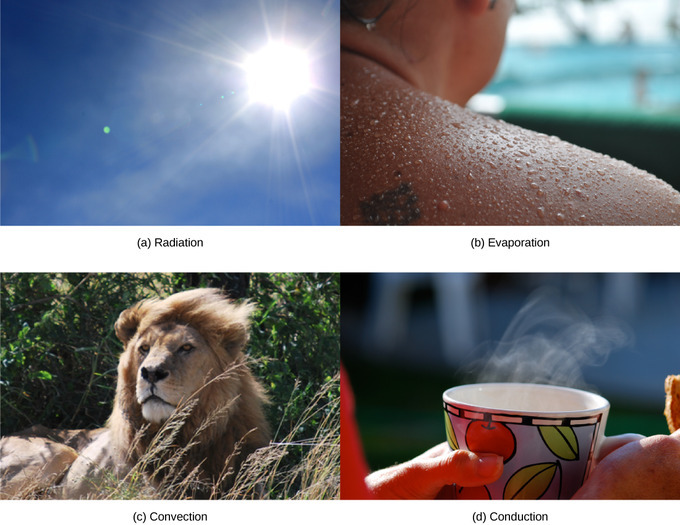 Heat can be exchanged between environment and animals via radiation, evaporation, convection, or conduction processes. ectotherm: An animal that relies on external environment to regulate its internal body temperature. endotherm: An animal that regulates its own internal body temperature through metabolic processes. homeotherm: An animal that maintains a constant internal body temperature, usually within a narrow range of temperatures. poikilotherm: An animal that varies its internal body temperature within a wide range of temperatures, usually as a result of variation in the environmental temperature. Internal thermoregulation contributes to animal’s ability to maintain homeostasis within a certain range of temperatures. As internal body temperature rises, physiological processes are affected, such as enzyme activity. Although enzyme activity initially increases with temperature, enzymes begin to denature and lose their function at higher temperatures (around 40-50 C for mammals). As internal body temperature decreases below normal levels, hypothermia occurs and other physiological process are affected. There are various thermoregulation mechanisms that animals use to regulate their internal body temperature. 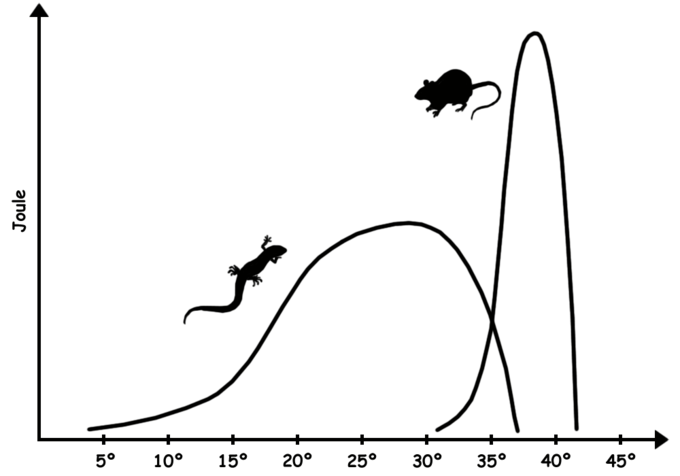 Thermoregulation in organisms runs along a spectrum from endothermy to ectothermy. Endotherms create most of their heat via metabolic processes, and are colloquially referred to as “warm-blooded.” Ectotherms use external sources of temperature to regulate their body temperatures. Ectotherms are colloquially referred to as “cold-blooded” even though their body temperatures often stay within the same temperature ranges as warm-blooded animals. Ectotherm: The Common frog is an ecotherm and regulates its body based on the temperature of the external environment. An ectotherm, from the Greek (ektós) “outside” and (thermós) “hot,” is an organism in which internal physiological sources of heat are of relatively small or quite negligible importance in controlling body temperature. Since ectotherms rely on environmental heat sources, they can operate at economical metabolic rates. Ectotherms usually live in environments in which temperatures are constant, such as the tropics or ocean. Ectotherms have developed several behavioral thermoregulation mechanisms, such as basking in the sun to increase body temperature or seeking shade to decrease body temperature. In contrast to ectotherms, endotherms regulate their own body temperature through internal metabolic processes and usually maintain a narrow range of internal temperatures. Heat is usually generated from the animal’s normal metabolism, but under conditions of excessive cold or low activity, an endotherm generate additional heat by shivering. Many endotherms have a larger number of mitochondria per cell than ectotherms. These mitochondria enables them to generate heat by increasing the rate at which they metabolize fats and sugars. However, endothermic animals must sustain their higher metabolism by eating more food more often. For example, a mouse (endotherm) must consume food every day to sustain high its metabolism, while a snake (ectotherm) may only eat once a month because its metabolism is much lower. Homeotherm vs. Poikilotherm: Sustained energy output of an endothermic animal (mammal) and an ectothermic animal (reptile) as a function of core temperature. In this scenario, the mammal is also a homeotherm because it maintains its internal body temperature in a very narrow range. The reptile is also a poikilotherm because it can withstand a large range of temperatures. A poikilotherm is an organism whose internal temperature varies considerably. It is the opposite of a homeotherm, an organism which maintains thermal homeostasis. Poikilotherm’s internal temperature usually varies with the ambient environmental temperature, and many terrestrial ectotherms are poikilothermic. Poikilothermic animals include many species of fish, amphibians, and reptiles, as well as birds and mammals that lower their metabolism and body temperature as part of hibernation or torpor. Some ectotherms can also be homeotherms. For example, some species of tropical fish inhabit coral reefs that have such stable ambient temperatures that their internal temperature remains constant. Heat can be exchanged between an animal and its environment through four mechanisms: radiation, evaporation, convection, and conduction. Radiation is the emission of electromagnetic “heat” waves. Heat radiates from the sun and from dry skin the same manner. When a mammal sweats, evaporation removes heat from a surface with a liquid. Convection currents of air remove heat from the surface of dry skin as the air passes over it. Heat can be conducted from one surface to another during direct contact with the surfaces, such as an animal resting on a warm rock. Mechanisms for heat exchange: Heat can be exchanged by four mechanisms: (a) radiation, (b) evaporation, (c) convection, or (d) conduction.